This DVD is 1 hour and 59 minutes long. It is one of the most popular training videos for new puppy owners. In the 1980's, the first version of this video was released. Since then, we have expanded and updated several times over the years. Our current version was completed in October 2010. This training video answers all the questions that new puppy owners have concerning the care of their new puppy. Ed Frawley has been breeding dogs cine 1978 and has produced over 350 litters of working bloodline German Shepherd puppies. Over the years, Ed Frawley has been asked just about every question a new puppy owner can think of to ask. In an effort to help educate these puppy owners, Ed Frawley created this DVD for his puppy customers and is applicable to all puppy owners worldwide. Leerburg breeds only German Shepherds but this video is not aimed towards German Shepherds only. 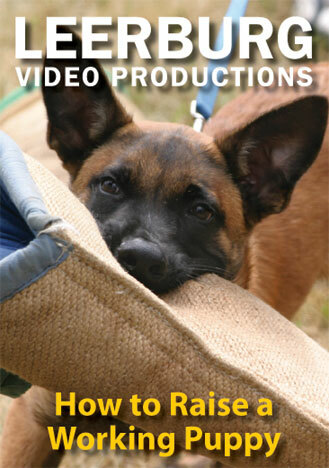 This DVD can apply to any kind of dog and is sold to breeders all over the country with dogs other than German Shepherds. New owners all want to train their puppy. This tape explains exactly how much your pups can learn and the proper way to train your puppy. While my DVD has an extensive section on how to house train your new dog it is impossible to include all of the information I would like to have included (there simply is not enough time on a DVD to do this). Puppy Obedience Store is a sub-domain of Leerburg, the largest state of the art dog training website with over 16,000 webpages written and approved by Ed Frawley.